President Obama gets an aerial view from his helicopter of fallowed West Side farmland. 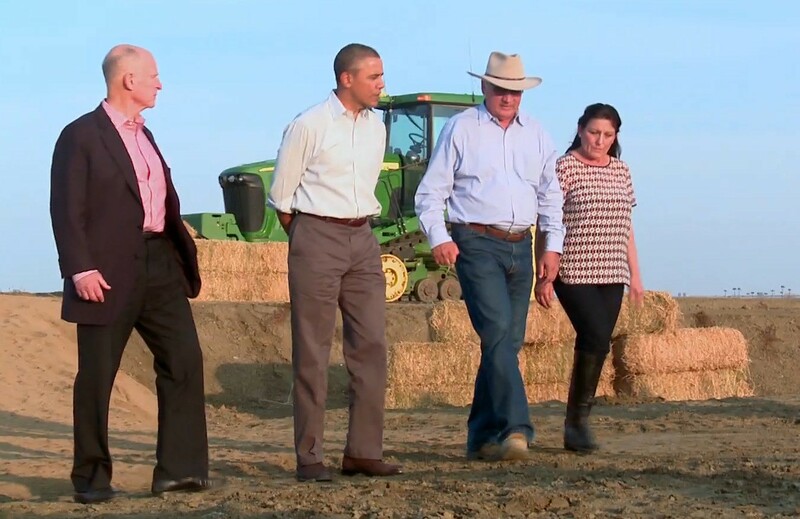 President Barack Obama’s brief Valentine’s Day visit to the parched western San Joaquin Valley has thus far resulted in no additional Central Valley Project water but did bring some federal drought relief financial aid and a great deal of national attention and news coverage that at least briefly was focused on California’s spiraling water crisis. Two top Friant Water Authority leaders – General Manager Ronald D. Jacobsma and Assistant General Manager Mario Santoyo – were invited participants in a late afternoon closed meeting with the President. It took place in a remote San Luis Water District shop building in western Merced County after Obama flew by helicopter from Fresno Yosemite International Airport, where Air Force One landed. Accompanying the President on the West Side were Governor Brown, California Democratic Senators Dianne Feinstein and Barbara Boxer, Representative Jim Costa (D-FRESNO) and Secretary of Agriculture Tom Vilsack, but none of the valley’s Republican Congressmen. “For many of us, we weren’t sure what message or assistance would be offered by the President,” Jacobsma said. “We may have had different hopes and expectations. Most of us certainly didn’t see the visit as a game changer, at least at this stage. The attention to the problem may be helpful. The financial aid will provide some targeted relief but such aid can’t offset the overall ag industry impacts of lost crop production or dead orchards to growers, ag employment and ag related industries. Jacobsma added that Obama’s “acknowledgement that infrastructure may be part of the solution was encouraging. The limited reference to environmental laws and regulations and impacts to the water supply system was disappointing. The focus on climate change doesn’t provide any immediate or near term assistance, and quite frankly is a bit of a distraction. 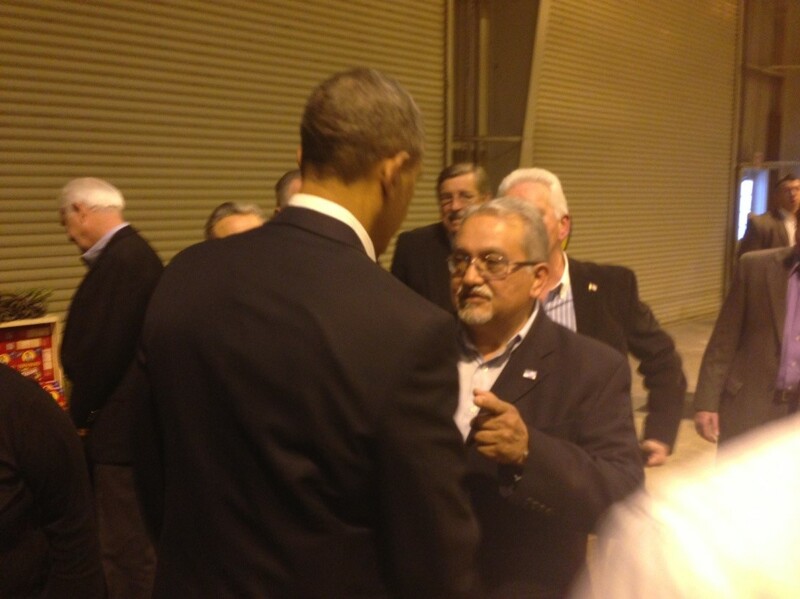 FWA Assistant General Manager Mario Santoyo explains Friant water storage needs to the President. So did Governor Brown. “He said storage in a more positive way than I’ve heard in the past,” Santoyo said. Obama opened the discussion “saying he was there to listen and he understood the unprecedented drought situation.” Secretary of Agriculture Vilsack, who conducted an hour-long discussion before Obama arrived, asked California Farm Bureau Federation President Paul Wenger to describe the water supply and farm situation. Wenger was followed by Westlands Water District General Manager Tom Birmingham, who talked about the valley’s drought situation and the hundreds of thousands of acres being fallowed or losing permanent crops. A Natural Resources Defense Council representative then made a short statement about environmental needs. “No one else was provided an opportunity to add to the discussion,” Jacobsma said. 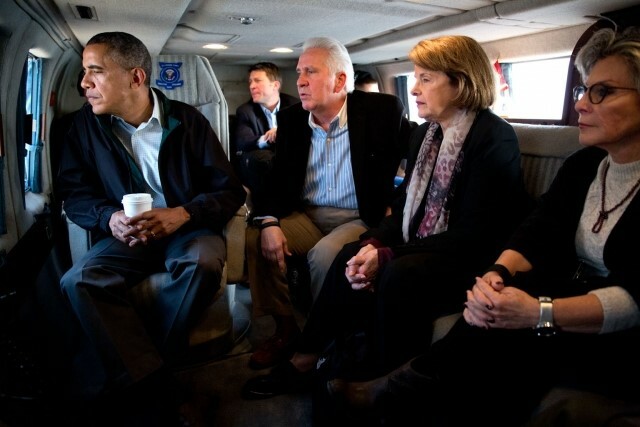 Governor Brown, President Obama, and Joe and Maria Gloria del Bosque during a West Side drought tour. According to a transcript made available by the White House, Obama’s remarks during the private meeting were similar to what he later told reporters. “There is a national concern around the drought that is facing California,” Obama said. “…But the truth of the matter is that this is going to be a very challenging situation this year, and frankly, the trend lines are such where it’s going to be a challenging situation for some time to come. “My goal today and I think my administration’s goal generally is to try to facilitate and work with a whole range of stakeholders at the local level and see how we can find common ground to point to a new direction moving forward. But I will say this: I think there’s a tendency, historically, to think of water as a zero-sum game, that either the agricultural interests are getting it, or urban areas are getting it, north, south. Given what we anticipate to be a significant reduction in the overall amount of water, we’re going to have to figure out how to play a different game. And if the politics are structured in just such a way where everybody is fighting each other and trying to get as much as they can, my suspicion is, is that we’re going to not make much progress – particularly because Jim Costa told me if you want to guarantee yourself a job in California, become a water rights lawyer. The earlier roundtable discussion with Secretary Vilsack was much more broadly based had representatives from the Governor, Senators Feinstein and Boxer, and Congressman Costa in attendance. Some 15 agricultural, water, and business representative and one NRDC officials spoke in the hour-long discussion. “Everyone, excepting NRDC, emphasized that additional water supplies and operational changes are the key and a more aggressive operating regime in the Delta to enhance water supplies needs to be pursued,” Jacobsma said. 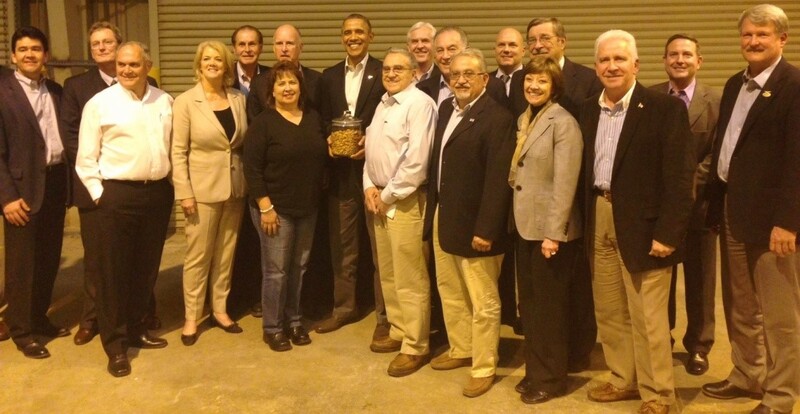 President Barack Obama (holding a jar of nuts that had been presented) is surrounded by those who were invited to attend a town hall type session on California’s drought at a San Luis Water District facility in western Merced County. The Friant Water Authority was represented by General Manager Ronald D. Jacobsma (back row, fourth from right) and Assistant General Manager Mario Santoyo (front row, third from right).